Sand Sea and Spray and Mozfest! Due to bad weather Sharrow Festival is postponed until 22 August, gutted, but I suppose I should make the most of getting up to date with sorting my photos. D7606 waiting for a call from Sid and Nancy on the other side. Found this while hunting dragons. A few weeks ago, I spotted a mural I hadn’t seen before in my fair city, by two of my favourite none Sheffield artists, Kid30 and Boaster. So I proudly,feeling quite pleased with myself, posted the pic on Instagram, and Boaster says “Did you get a picture of the dragon?”! There’s a dragon?….Well it took a while, but I got there in the end, well chuffed! 🙂 I thought this was Cantastic Art, turns out I was right, had to happen one day! Foundry and See(the rarely seen! 😉 ) collaboration, need more of these. Stunning Octopus by CoLor. 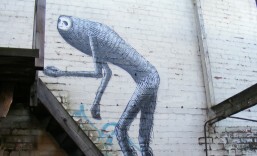 PeteFowler, a Welsh Artist, came to Sheffield and made this. Alex Turner, Phil Oakey, ? , Joe Elliot maybe? C***face by Obit, I know I should know better, but I absolutely love it! Kisk x Meth x STOG x Trik9, good to see these guys keeping busy. I photographed this in rush hour traffic and do have to thank various motorists for not running me over and one even stopped so I could get a clear shot! I don’t know who did this, but I think it’s great. Perhaps this post should come with a Parental Advisory rating! Some feeling the green. Like this, whatever it says 🙂 Gums, simple but effective and always make me smile 🙂 Denta x Earth x Teml, probably…. Pawski and Shoe go seriously large with this wonderful piece on a pretty unusual canvas. Osim x Deap x Jonas, going through a purple patch, looks lovely with the white umbellifers ( apologies for going all Gardeners World!) Disappearing Stabby woman with legs! I don’t think Kid Acne made her disappear…..must be magic!